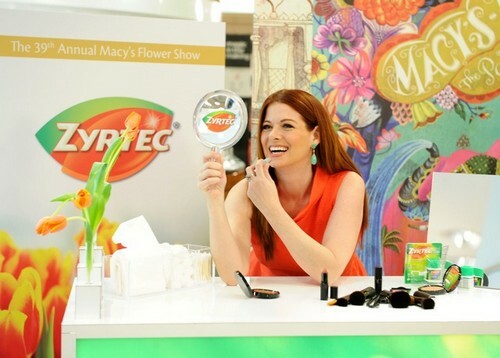 This morning Debra Messing, actress in the broadway-based television show, Smash, who recently signed on for the lead of a new CBS comedy pilot, was at The Macy’s Flower Show in Herald Square to team up with Zyrtec to combat Allergy Face. The actress, who is also a frequent allergy sufferer, was on-site to unveil the Zyrtec Allergy Friendly Garden, which is open to the public throughout the Flower Show, and the Allergy Face Beauty Counter, where allergy sufferers can stop by for an Allergy Face makeover on 3/28 or 3/29 from 10am-3pm. While at the Macy’s Flower Show, Debra looked smashing in a red dress by David Meister and confessed that as an actress, looking and feeling her best is essential. If she has a press event or photo shoot, she doesn’t want to worry about the impact of allergy season, and the beauty woes that come with it — like a red nose, watery eyes and a puffy face. That’s why she’s teamed up with Zyrtec to help women feel better both on the inside and out. No matter where I am, I travel with eye drops in my bag. The ones with saline help keep my eyes free and clear of pollen and dust. I have a great home remedy that I’d recommend to anyone who has dealt with that puffy face feeling. In a bowl, I soak a face cloth in aloe vera or cucumber juice and allow it to chill in the fridge. I then apply the cloth to my face for about 10 minutes. The soothing ingredients in the cucumber and aloe – along with the cool temperature – can help relieve puffiness. Another beauty trick I love to take advantage of is the big, bold brow trend, which is great because it allows you to go easy on eye makeup. Shaping and penciling your eyebrows can help “wake up” any Allergy Face. When I feel like treating myself I’ll splurge on a laser genesis facial, which helps to even out my skin tone. Dry Shampoo is another great quick beauty fix. I’m always too over eager when using it myself, but my hairstylist on Smash uses it all the time. While at the Flower Show we were also able learn a little bit about what’s next for the busy mom. She’s currently working on a new pilot based on an Israeli series. Debra told us she’s excited to get back to comedy and the show focuses on a working mom trying to balance everything, which she can definitely relate to. When asked how she balances both her busy career as an actress, her activist work, and taking care of her son, she told us it definitely takes a village and she’s blessed to have people in her life who are so willing to help her juggle it all. Often, when she is shooting long hours, she’ll leave voicemails on her son’s phone.